CHILD 44 is a handsome, well-acted thriller set in 1950s Soviet Russia, direct by Daniel Espinoza (SAFE HOUSE) from a script by Richard Price (CLOCKERS) based on the book by Tom Rob Smith. 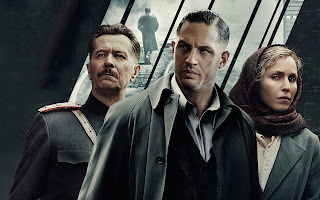 Hardy stars as Leo Demidev, a Soviet war hero and member of the Soviet security forces, supposedly happily married to his beloved wife (Noomi Rapace) until his war-time friend's child is murdered. Sent in to persuade the grieving parents that it was just a tragic accident, Leo soon realises that the reality of his marriage, and the reality of the crime, is corrupted and compromised by the insidious Soviet paranoid political culture. The wonderful thing about the film is that the personal and the criminal are completely intertwined because in the paranoid Soviet police state, both are political. Leo and Raisa's relationship is constrained by the expectations that people have of the type of men who do his job and they are both vulnerable to denunciation from colleagues. Similarly, this film cannot be a simple police procedural in a political system that categorises murder as a crime of decadent capitalist states. The system is perfectly explained and embodied by Gary Oldman's General Nesterov. He begins the film unwilling to investigate the serial killing of children because it puts his job and his colleagues at risk. But we soon realise that he is a canny operator, able to bend the rules and find the truth. And the journey of the film is that of Leo Demidev, who must also become hardened and suspicious and learn to play the system, as embodied in Charles Dance's high ranking officer, to his advantage. Hardy's performance is stunning once you settle in to his accent. I love seeing this rather simple-minded war hero deconstructed in a pivotal central scene, and then recreated as a savvy criminal investigator. The picture of his marriage as complex and nuanced is one that is rarely seen on screen. I was also impressed by Joel Kinnaman as the ruthlessly ambitious officer and by Paddy Considine, in a desperately pathetic performance as the killer. Overall, this is the kind of thoughtful, layered cinema once wants to see more of. Kudos to all involved. 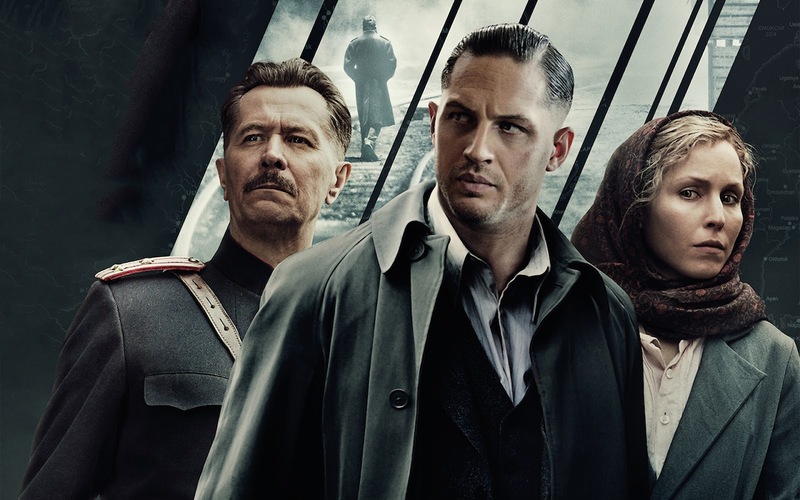 CHILD 44 has a running time of 137 minutes and is rated R. The film is on release in the UK, USA, Belgium, France, Greece, Hong Kong, Hungary, Israel, Kuwait, Singapore, Finland, Ireland, Cambodia, Pakistan, Estonia, Lithuania, Mexico, Poland, Philippines, Denmark, Italy, Norway and Sweden. It opens in Argentina, Croatia, Macedonia, the Netherland, Serbia, Turkey, Brazil and the Czech Republic in May, in Germany, Portugal, Slovakia and Spain in June, in Japan, Peru and Australia in July and in Chile in August.